2017 CMA Awards Photos, News, and Videos | Just Jared Jr.
There’s been a long running theory that Brittany Snow and Niall Horan were twins separated at birth — however, two people who just don’t see it are Brittany and Niall. After an article from 2013 was posted, fans started to make connections between the actress and musician — and the article did do a pretty good comparison between the two. But after meeting at the 2017 CMA Awards last night (November 8) in Nashville, Tenn., they just aren’t seeing the resemblance. Check out pics of Brittany at the awards below! 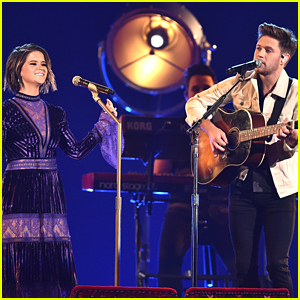 Niall Horan Performs 'Seeing Blind' with Maren Morris at CMA Awards 2017 - WATCH! Niall Horan hits the stage with Maren Morris to perform at the 2017 CMA Awards at the Bridgestone Arena on Wednesday (November 8) in Nashville, Tenn. The 24-year-old singer and the 27-year-old country singer performed their new collab “Seeing Blind” along with Maren’s song “I Could Use a Love Song” at the awards show. In case you missed it, the duo will be teaming up again with Maren joins Niall as the opening act on his 2018 Flicker World Tour. Watch a clip from their performance below! Lauren Alaina turned heads in a dark red gown at the 2017 CMA Awards! The “Road Less Traveled” singer hit the red carpet for the big night held at the Bridgestone Arena on Wednesday (November 8) in Nashville, Tenn.
She paired the cut-out dress with matching dangling earrings and silver and black accessories. She was joined by country music duo Dan + Shay, who looked sharp in their blue and purple suits. Lauren brought along her boyfriend Alex Hopkins, Dan brought his wife Abby, and Shay was joined by his wife Hannah. Lauren is up for New Artist of the Year, while Dan + Shay are nominated for Vocal Duo of the Year. The trio will team up for a performance tonight as well. FYI: Lauren is wearing Vitor Zerbinato with JN Jewels jewelry and an Onna Ehrlich clutch. 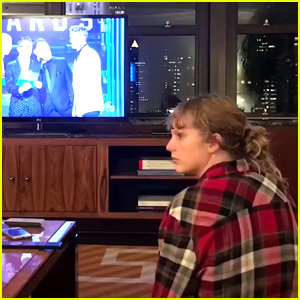 Taylor Swift wasn’t able to attend the 2017 CMA Awards as she is in New York City preparing for her performance on Saturday Night Live, but she still shared her reaction to winning with fans. The 27-year-old singer watched the event live from the Big Apple and posted a video to Twitter from the moment she won Song of the Year. She won for writing the song “Better Man,” which was recorded by Little Big Town. LBT accepted the award in Tay‘s absence. “In NYC for SNL rehearsals. I LOVE YOU @littlebigtown and CMAs,” Taylor tweeted with the video. It’s going to be hard for Kelsea Ballerini to top this moment! The 24-year-old country singer performed alongside living legend Reba McEntire at the 2017 CMA Awards at the Bridgestone Arena on Wednesday (November 8) in Nashville, Tenn.
Kelsea and Reba performed “Legends,” a song on the young star’s new album Unapologetically. Earlier in the night, Kelsea hit the red carpet with her fiance Morgan Evans and they made one super cute couple. Kelsea was even mentioned by the show’s host Carrie Underwood during the opening monologue for getting engaged this year! Taylor Swift just won at the 2017 CMA Awards and it is her first win at the show in four years! The 27-year-old singer moved from the country to pop music world with her last album 1989, but she still has country in her. Taylor won Song of the Year for writing the song “Better Man” for Little Big Town.